Spawns only during an Event. 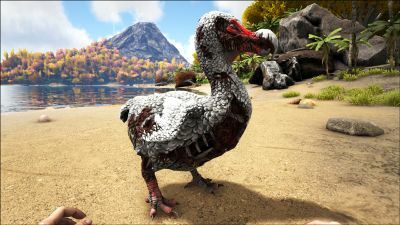 The Zomdodo is an undead variant of the Dodo added in ARK: Fear Evolved. Zomdodos usually spawn in groups and will attack anything they see. The group will spawn clustered around the DodoRex, which itself will spawn in a random location on the map during the ARK: Fear Evolved event. A Zomdodo is more resilient and hits harder than a regular Dodo, in addition to moving much faster. The Zomdodo is a zombiefied version of the dodo with pieces of flesh missing. This section displays the Zomdodo's natural colors and regions. For demonstration, the regions below are colored red over an albino Zomdodo. The colored squares shown underneath each region's description are the colors that the Zomdodo will randomly spawn with to provide an overall range of its natural color scheme. Hover your cursor over a color to display its name and ID. For example, "cheat SetTargetDinoColor 0 6" would color the Zomdodo's "body" magenta. Zomdodos cannot be tamed under normal circumstances. While the DodoRex is active, they will be hostile. However, once the DodoRex is killed, surviving zomdodos become passive, and a player can tame one simply by walking up and pressing the use key (e by default) to claim it. A Zomdodo has no inventory, nor can they lose hunger, be fed, gain experience, or lay eggs. Otherwise, they act as a living dodo. Although Zomdodos cannot gain levels, their base stats seem to make them quite formidable. Like with the Dodorex, when near Zomdodos, the Ark: Fear evolved theme plays. Inside The Center, a free DLC, they can gain levels on Lava Island. This page was last edited on 14 April 2019, at 16:49.